Whenever I drive to Cerritos on a growling stomach in search of Filipino food, I often ask myself this question: Why is Cerritos part of L.A. County? More succinctly: why is this city, which is mere minutes or ten miles from Disneyland but at least an hour or twenty miles from downtown L.A., not considered part of Orange County instead? By claiming Cerritos, and its less attractive sister Artesia, L.A. County hogs the Filipino enclave closest to O.C., when it already has many to call its own in Panorama City, Glendale, and Eagle Rock, just to name a few. Like a spoiled rich kid who refuses to let the other children play with his toys, L.A. County leaves O.C. bereft of all the great Pinoy places to chow. Excellent eateries like Magic Wok, and even middling ones like Goldilocks and Salo-Salo Grill, are all within reach to O.C. 's citizenry but lie officially on the other side of the L.A./O.C. line. But rather than fight city hall, I prefer to eat. And this week, my trip to Cerritos brings me to the Red Ribbon Bake Shop, which is neighbors to two other Filipino eating houses, Chowking and Pinoy Pinay, none of which, I might add, exists in O.C either. Red Ribbon is famous for their sublime cakes, which are always the talk of every party they grace. The Mango Cake, in particular -- one of their best and most popular -- is a perfectly constructed and not-too-sweet feather-soft sponge-cake lovingly frosted with whipped cream, sandwiching a layer of ripe mangoes perkier than Lea Salonga. Although it is, first and foremost, a bakery, inside their cramped, claustrophobic store, there's a tiny dining area where you can feast on a number of savory specials that they also offer as merienda (snacks) and light meals for a pittance of $3.99. 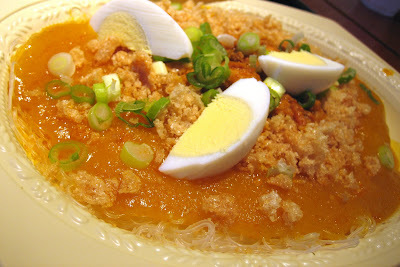 One of them is my current obsession in the phylum noodle: Pancit Palabok. To order a plate of Red Ribbon's Pancit Palabok, is to get a styrofoam dish of jiggly rice vermicelli threads, smothered with an orange, porky gravy as thick as goo. Topped with diced green onions, ground pork, hard-boiled egg quarters, and pulverized pork rinds, it's food you'd typically see being sold by hawkers out of roving carts on the streets of Manila. I started by drizzling on a few packets of factory-sealed lemon juice, proceeding to mix up the whole mess together with a fork until every strand was lubed in that unctuous sauce. Slurp, after sloppy slurp, I reveled in the lemony tart and salty flavors that was simultaneously subtler and more complex than pad thai, but less cloying than spaghetti. I loved this dish, but seriously, who wouldn't love a dish that utilizes pork rinds? Another dish that played directly to my comfort-food sensibilities is their Embutido, a steamed meat-loaf made of pork and pockmarked with raisins. 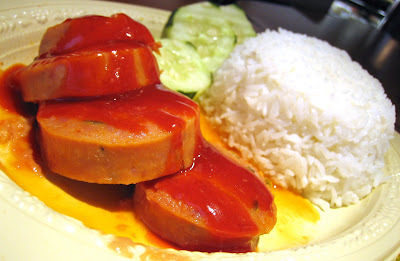 Cut into silver-dollar rounds as thick as steaks, it is draped with a zig-zag of neon-red banana sauce and then served with hot, steamed rice. The taste is akin to Oscar Meyer bologna, with a bite that is just as bouncy. As I drove the short distance back to O.C., I rethought my gripe about Cerritos, Artesia, and L.A. County. It mattered less what jurisdiction these cities fell under, and mattered more that my stomach was full of Pancit Palabok and Embutido. More importantly, I was happy that I didn't have to drive to Glendale to get it. I also realized that I get grumpy when I'm hungry. This post makes me sad. In Illinois, it was easy to find good Filipino food. Even though we are much happier here in Michigan, it's impossible to find this yummy stuff. :-( There used to be a market here in town with a nice deli that had great food, but it's gone now. I guess I'll need to just get a cookbook. And of course, you know what my top culinary choice will be when eating out on our next trip to CA. I agree with you, Elmo: let's reconquista Cerritos and Artesia! Mmmmm. Red Ribbon. I've never had any of their savory dishes, but my parents would sometimes bring home some of Red Ribbon's various pastries and pan de sal when I was growing up. oh man, i need to go here again. you made me realize how much i missed the mango cake! Hey Elmo - Good ol' Red Ribbon Bakery! And pancit palabok to boot! I've been reading your blog for quite some time, I love it~! 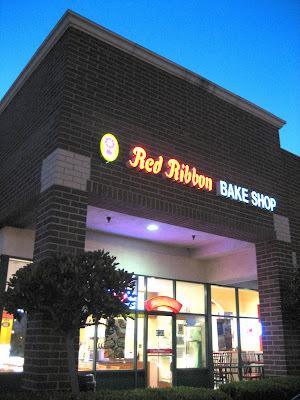 I always think of Red Ribbon as the gold standard for filipino bakeries. As disappointed as my mom would be Red Ribbon is my mainstay for getting filipino fast food and I often escape the store barely eluding diabeties. Aww. It's one thing to have to drive to the LA County line to find good Filipino, it's quite another not to have any within driving distance. Thankfully, sinigang, and other dihes are simple to make with ingredients found at the Asian markets. We'll start with Artesia. They got Little India, and the greatest Pinoy food in the country in Magic Wok. It's a two-fer! The savory stuff is considered fast-food, so it's great for a quick bite. Tasty empanadas too! But once you're there, you do need to get some of the sweets. It's unlawful not to! I had the Mango Cheesecake and it was great too. But nothin' beats that Mango Cake. You don't know how lucky you are to have not one but two of them in the SD area! Nada in OC! Thanks! I'll keep trudging away! I don't know if I'm just biased by the quaintness of the shop, but I think it's cheaper than Goldilocks. Assemble the troops. The OC food bloggers are going to war. Time to annex Cerritos! Looks soooo good. Cerritos has tons of great spots we in the 'OC' don't. Hi Elmo ~ totally unrelated subject... any suggestions for good/real kobe beef steak dinner? btw, great write up on one of my favorite Filipino bakeries. I bust up laughing at imagining our cartoon and muppet alter-egos leading the charge Braveheart style towards the LA County line, only to be met with the LAPD's Riot Squad! That's the truth. Cerritos and Artesia's got a lion's share of good vittles! Between the two cities, they've got a Korean area, a smattering of Filipino joints/groceries in dispersed pockets, at least one Chinese center, and the whole of Little India! Kobe beef dinner eh? I've not yet had the pleasure, but when I get the chance, it'll be at Tsuruhashi in Fountain Valley. If you get to try it before I do, let me know what you think! The Chicken Empanadas are the bomb over there, I grab at least a dozen whenever I'm in that area. I am always amazed at all the Cerritos places you mention in your blog, when every other website/message board generally says there's nothing in Cerritos to eat and advises driving to Long Beach. I've walked into the Red Ribbon before, but never gotten anything out of fear of the unknown--I'll have to try the pancit, although the meatloaf with raisins seems a little outre for me. I will agree the Mango Cake at Red Ribbon is really good but try also the Toffee Krunch which is one of my favorites. But there is one thing that is available in the Philippines that isnt available here and that is the Mango Creme Pie from Red Ribbon. I have asked about this but sadly they said they cant make it with the unpredictability of mangoes here. Oh well at least theres the mango cake. Their pancit palabok is good but I suggest you try the Pancit palabok from Manila Sunrise in Carson. Its the best I have eaten and I have eaten plenty. Oh man. By the time I remember the empanadas, I'm too full. But your right, I've had them, and if they had more chicken in them, it'd be a pie. Yet another reason! HAHA! If I had the power, I'd also make Cerritos even closer to Irvine. Maybe the best parts of it can be plonked right onto Villa Park...JUST KIDDING you Villa Parkers! If only Carson were closer to O.C. Then I'd call for annexing it too. I always buy in Red Ribbon for my kids.They really love the chiffon cake. Wow! nakakagutom. Red Ribbon have the best cakes. I didnt know they also have pancit. Do they have Lechon?